Notification 2018. Interested and eligible candidates can apply through online mode only. The online official web portal for applying these jobs is www.i-register.co.in. The application forms are available through online from 29-09-2018. The last dare to submit the application form through online is 29-10-2018. The candidates will be shortlisted based on merit in written exam. 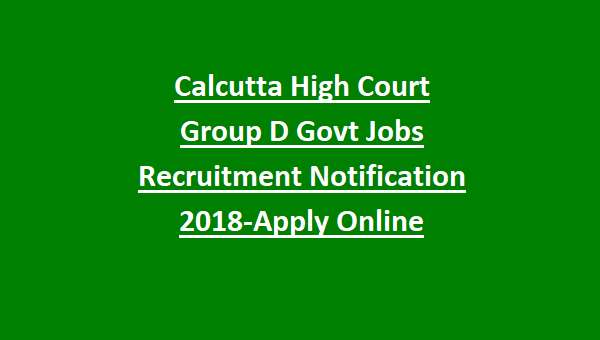 For the other details of age limit, educational qualifications, selection process, available vacancies and how to apply are given below for the Group D Peon jobs in Calcutta High Court Recruitment Notification 2018. There are total 221 available vacancies for Group D Peon, Cleaner, Orderly posts. As on 01-01-2018 the age limit for the candidates is in between 18 – 40 years. 5years age relaxation will be given for the West Bengal candidates. For reserved candidates age relaxation will be applicable as per the Government norms. Candidates must have passed 8th examination. Graduate candidates are not eligible to apply. Candidates must have knowledge of reading and writing Bengali and English. The salary offered for the selected candidates is Rs.4900 -16200/- with Grade Pay of Rs.1700/-. The application fee for the candidates belongs to SC/ST category is Rs.150/- + Bank Charges. The application fee for the candidates belongs to Others category is Rs.400/- + Bank Charges. The Last date for payment fee through offline (Banking Hours) is 27-10-2018. The candidates will be shortlisted based on their performance in written exam (OMR based). The exam date will be on 25-11-2018. The merit list will be displayed on 10-12-2018. The OMR question paper will consists of 50 questions total 100 marks in time duration is 75 minutes. Interested candidates can apply for these jobs through online mode. For applying the official website portal is www.i-register.co.in. The online application forms starting from 28-09-2018. The last date for submitting the application form through online is 29-10-2018. After submit the application form candidates can download admit card from 10-11-2018.The last date to download the application form is 25-11-2018. The exam date will be on 25-11-2018. For more details candidates can check in the official website of Calcutta High Court is www.calcuttahighcourt.gov.in. 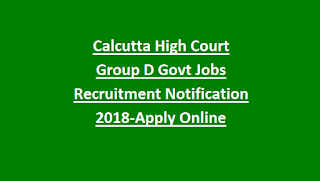 Candidates can download the admit card from the official website of Calcutta High Court is http://www.calcuttahighcourt.gov.in/ before 25-11-2018.